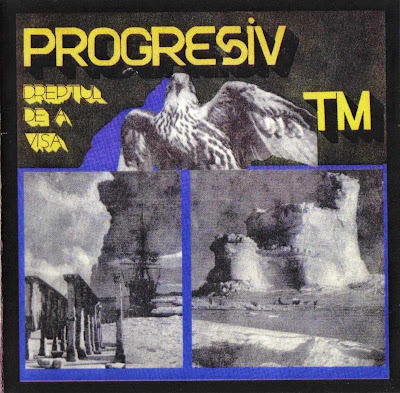 Strong power trio playing, subtle vocal harmonics and cascading flute flourishes characterize the first LP of Progresiv TM, definitely one of Romania's most ear-catching bands from the seventies. The typical Romanian qualities of expert musicianship and excellent vocal parts are omnipresent, but still most of this LP is hard rock with a strong penchant for soaring melodies and always interesting flute interceptions. The production is extremely simple, almost no studio effects are used, rendering the album a bit "dry" in sound, but the knack for unexpected melody (check the marvellous "Clepsidra", a truly progressive marvel) makes up for this in full. There's a heartbreaking ballad too, "Nimeni Nu E Singur". Four years later the sound had developed into a more sophisticated blend with even some strings and piano thrown in, but basically all the earlier qualities remained. The combination of piano with these kind of melodies makes the sound at times almost Italian. Production values have improved greatly, making this more varied and less a pure "hard-rock with flute" album. The long opening track, "Oameni Si Fapte / Legamint" would bo obligatory for any "best of the east" compilation with its lush harmonies, great diversity and arching themes. Side two has more emphasis on dexterous guitar playing and tends to get quite poetic, the title of the record ("The Power Of Music") rings completely true. Absolutely top-notch by any standard.